It's not controversial to state that 2014's Guardians of the Galaxy is among Marvel Studios' best efforts, with a solid ensemble cast, an incredible blend of humor and action and a cinematic swagger rarely seen in modern-day blockbusters. There's no way a sequel could measure up, right? Wrong. So, so wrong. Somehow, James Gunn did it again, giving us a follow-up that takes even more risks than the original while maintaining that rebellious spark that made us all fall in love with Star-Lord, Drax, Gamora, Rocket Raccoon and Groot three years ago. My new obsession with all things Baby Groot aside (various plush and plastic iterations of the little guy seem to be making their way into my apartment lately), Guardians 2 immediately struck me as a welcome rarity among recent, laboriously interconnected Marvel Studios films in that it exists solely as a sequel to the first movie. As such, the film is able to take its time telling a smaller, character-driven story that doesn't exist solely to bring us crossover cameos or propel the Guardians team toward Avengers: Infinity War. Granted, I just called a story revolving around a sentient planet "smaller," but all things being relative in the Marvel Universe, it's fairly focused in its scope. Without delving into spoiler territory, I'll state that the film revolves mostly around the relationship between Peter Quill, a.k.a. Star-Lord (Chris Pratt), and his otherworldly dad Ego (Kurt Russell), who has a lot of explaining to do regarding his relationship with Peter's late mother. Meanwhile, Peter's blue-skinned "adoptive" dad Yondu Udonta (Michael Rooker) is on the outs with the Ravagers since we last saw him, and the rest of the Guardians, including the aforementioned infant Groot, get incredibly involved in Star-Lord's daddy issues, making a friend or two along the way. With its story being fairly simple, Guardians 2 spends much of its screen time building on relationships, including the aforementioned father/son connections. We see Gamora (Zoe Saldana) make amends with her "sister" Nebula (Karen Gillan) as Rocket (voiced by Bradley Cooper) realizes he has more in common with Yondu than their love of money. 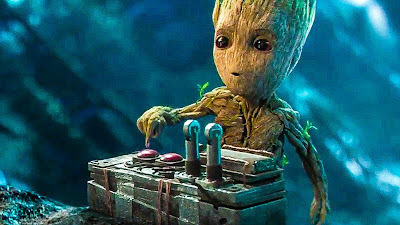 The overtly literal Drax (Dave Bautista) strikes up an unexpected friendship with empathic series newcomer Mantis (Pom Klementieff), while Groot (still somehow voiced by Vin Diesel) essentially brings the whole dysfunctional family together as its curious, mischievous and sometimes stubborn child. The film just works as a humorous, escapist fantasy, which is something that's pretty necessary given how crazy, unpredictable, divisive and, at times, scary the real world has gotten lately. For 136 minutes, I was completely immersed in the spacey Marvel Universe and for that, I'm grateful. But Guardians 2 is not necessarily a perfect movie. The effects-laden climax drags out for a bit too long, and the soundtrack, while memorable, doesn't resonate as much as that of the first film. That doesn't mean I haven't been rocking out to "Mr. Blue Sky" before work every day this week, but it's hard to complete with the music of the original Guardians. Overall, Guardians of the Galaxy Vol. 2 is an easy film to love, and if you enjoyed the first movie, there's no reason why you won't have a blast this time around. And, as is always the case with Marvel flicks, be sure you stay through the credits. It is going to be a blockbuster I am telling you especially the story line they have is really of the interest of many people especially the kids.